Click the button below to add the Dark Chocolate Coated Ginger to your wish list. 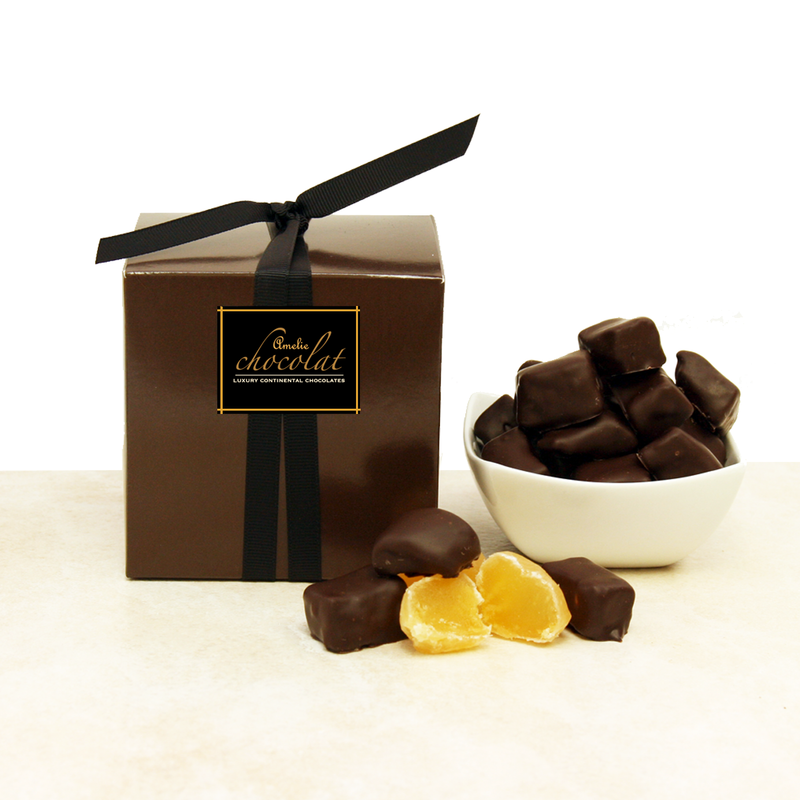 DARK CHOCOLATE COATED GINGER ...delicious & healthy all in one … superb chunks of glazed ginger enrobed with deliciously rich dark chocolate. Slices of young freshly peeled ginger root are gently boiled and cooked in natural cane sugar syrup. Once softened and cooled, the slices are dipped in and coated with lustrous dark chocolate. Ginger has been eaten as a sweet confection since the time of Marco Polo. In the 17th century, the English would often eat a few pieces of ginger after dinner as, in addition to its contrasting sweet & sharp flavours, ginger was also known for aiding the digestive process. This is still the case today, as well as ginger being used as a natural remedy to relieve many other symptoms. These traditional and very popular bite-size treats are the perfect indulgence for any love of excellent ginger. Presented in a brown cube gift box and finished with a hand tied Amelie satin ribbon and your personalised gift card.